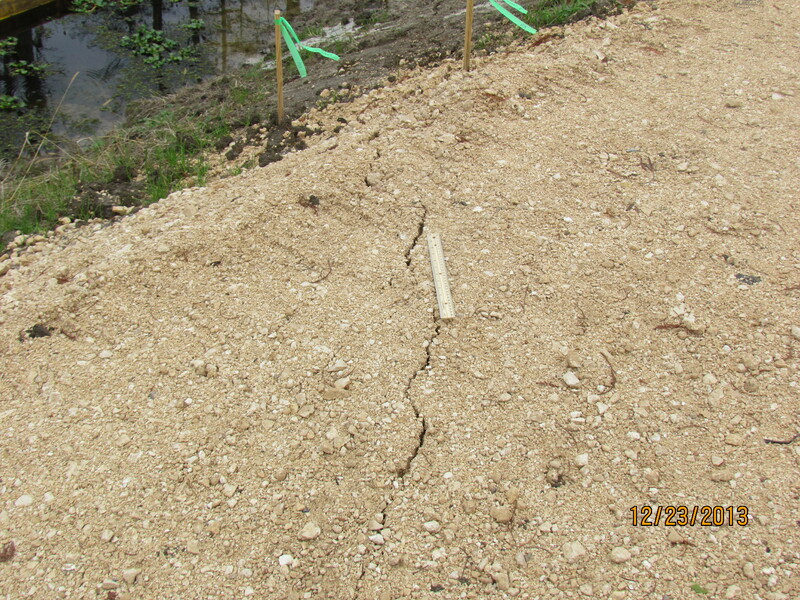 Attached is photo taken this morning of the ongoing subsidence of the center portion of the Southern Berm. We continue to monitor any changes that may occur and will update accordingly. of a new southern containment structure. 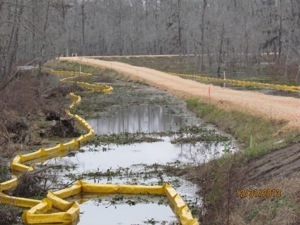 TBC will then proceed with the installation of this new southern containment system once the requisite permission and approvals have been received from DNR, DEQ, and APOEP. warning of any movement due to subsidence in this area. Multiple layers of boom are also in place as redundant systems to provide protection against floating contaminants should any overtopping take place. Water quality testing is continuing to take place and consistently shows that the surface water quality within the containment berm is virtually the same as waters outside the containment berm. Sinkhole Activity Code 3 – indicating no work is allowed directly on sinkhole or within containment berms. Seismic monitoring indicates further increase in levels of subsurface activity near sinkhole/Oxy 3 – state and parish will continue to closely observe seismic activity to advise of any sudden changes. Texas Brine advised that the tagging of Cavern 3 is at 4,076′ which is 66′ lower than the tagging performed two weeks ago. As information becomes available, it will be shared here. Garbage will be picked up on SATURDAY. This same schedule will be followed next week (New Year’s holiday). The South Berm has developed cracks where a previous crack was repaired, as well as new cracks in the lowest part of the berm (in a half moon shape). Attached is a picture of the cracks where previous repair was completed. Additionally, the Micro Seismic Activity (MEQ) has been up for the last few days, with counts as high as 180 MEQ’s yesterday. We will keep everyone posted as information develops.